I continue to try apps and services to achieve everything I’m looking to do to help facilitate my goals around digital preservation . In a discussion I had with Tom Geller, he told me to take a look at SocialSafe which had been mentioned to him by Gordon Bell as a good service for lifelogging. That’s all the endorsement I needed to give it a try. SocialSafe is software that allows you to import and aggregate the content you create using social services (currently supports 10) on the web to your computer. Once data is imported you are provided with some nice statistics and can also quickly search and filter through the content you’ve imported. A nice feature that I really liked was the ability to navigate through all of your content using a calendar which makes it easy to quickly view specific dates. You then setup a schedule to have SocialSafe sync to the services you connect so that it can import all new content you create moving forward. You also have the ability to selectively choose which types of data you want to sync so in the case of Facebook this allows you to choose photos, friends, status updates and more. One of the key features that I found to offer a distinction for SocialSafe was it’s ability to export your social data as files to your local computer. I tested this with Facebook data and liked the method it used and data generated for the export more than what I’ve been able to export using Facebook’s export tool (visit here and click “download a copy of your Facebook data”). I tested the Twitter export as well. In this case I really like the method and data that Twitter offers for their exports but it’s a bit of a pain in that you have to manually request archives to be created and wait for the package to be delivered. With SocialSafe you set the import schedule and forget it so that you will always have your data backed up locally. 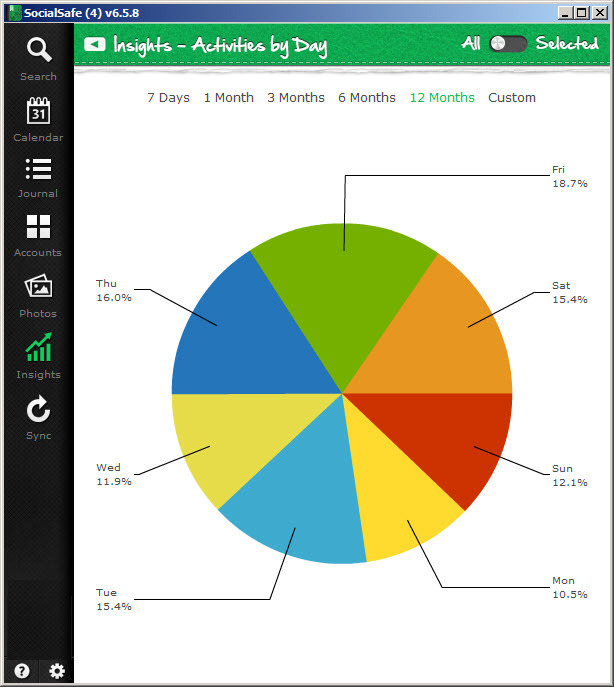 SocialSafe also had a few other features that liked which included an insights area which highlights your most popular content based on user interactions and a breakdown of your social activity by day. Another very cool feature they have is providing a time machine into the past by highlighting content every day from previous years which appears on your computer. It’s very similar to what Timehop does but it’s just for you on your computer. It’s a great way to initiate visits to initiate going back to re-discover past experiences. The current roadmap has some great features coming which include exporting to PDF and Rich Text and better data organization. If they begin adding quantified self related services like Fitbit, 23andme, Runkeeper and others it could become a very nice personal data repository. I would however like to see software like this go beyond importing cloud data and include local content like the photos, videos, documents and other data which may be private that I don’t share to social networks. Another feature on the roadmap that has me excited is they are working on adding the ability to write journal entries directly into the software as well as offer private commenting for the data imported. This takes their product from content aggregation and organization to creation. It’s a great step towards consolidating additional software like smart journals. Once software allows us to archive every digital asset we’ve created, both online and offline, it could then become a truly comprehensive record of our lives. 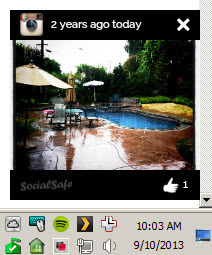 I think SocialSafe has taken some good initial steps towards becoming a great piece of software for lifelogging and digital preservation and I’m looking forward to continue watching it evolve. Update: Added this interview Robert Scoble did with SocialSafe chairman Julian Ranger alongside Gordon Bell.